BlackBerry Storm launches in Taiwan | BlackBerry Blast! Taiwan Mobile and Research In Motion announced that the highly anticipated BlackBerry® Storm™ - the first touch-screen BlackBerry® smartphone - will be available in Taiwan tomorrow. 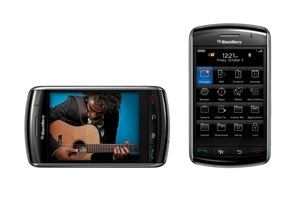 The BlackBerry Storm smartphone features the world’s first “clickable” touch-screen and delivers the renowned usability and performance of the BlackBerry solution with powerful communications and multimedia features. Honoured with the GSMA’s Best Mobile Technology Breakthrough award at Mobile World Congress 2009, the BlackBerry Storm smartphone's unique SurePress™ touch-screen depresses ever so slightly when the screen is pressed, dramatically enhancing the touch interface for both typing and navigation and giving users an experience they can actually feel. The BlackBerry Storm offers a large and stunning display together with a first class phone and the industry’s leading email and messaging capabilities, as well as many other powerful features including 3G (HSPA) network support, desktop-style web pages, advanced multimedia capabilities, 3.2 megapixel camera and built-in GPS – all designed to give users a fast and intuitive mobile experience. Taiwan Mobile also announced new monthly plans for BlackBerry® Internet Service at NT$390, NT$690 and NT$990, providing customers with flexible and economical choices for service. The BlackBerry Storm smartphone is available at only NT$8,990 for customers who sign up with a plan at NT$990 for 24 months and Taiwan Mobile’s Myzone voice service plan at NT$968 for 12 months.